Konami Losing Borussia Dortmund License For Pro Evolution Soccer PES 2019 Game is really a shocking news to all Fans of PES. This was leaked by Borussia Dortmund Fans lately and this can take FIFA to the Top. Borussia Dortmund agreement with Konami has been canceled by the club and they didn't tell why, but the contract was meant to be on until 2020. It posted the statement to advise fans that although the team had appeared in marketing shots of the game so far (above), it won’t be in the final product when that launches at the end of August. Borussia Dortmund was the only top-flight Bundesliga Club to appear under it's own real name without it having to be ringers. There was no German domestic league unlike Liga BBVA, English League, and Italy in the game. Konami, over the years, has put together a patchwork of licenses for clubs like FC Barcelona and other Premier League teams. Meanwhile, Schalke 04 has been included in the Pes 19 game. It's not that bad for developers to lose licenses of games alongside it's soundtrack or even the game itself, what makes this worst is that the license agreement hasn't expired and it has been canceled ahead of the two years agreement. And this has been a bad stuff for Konami becuase they have used the team's screenshots and stadium to promote the Upcoming Pre Evolution Soccer 2019 when it was announced last month. It's not especially weird for developers to lose licenses with songs in a soundtrack, or even have entire games disappearing as licenses expire. 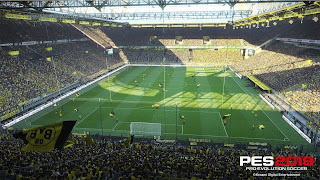 What is strange in this case, however, is that the German club has terminated the agreement a full two years ahead of when it was set to conclude, and after screenshots of the team and stadium were used to promote the upcoming Pro Evolution Soccer 2019 when it was announced just last month, all of which will now no longer be in the final product. Pro Evolution Soccer 2019 launches Aug. 28 on PlayStation 4 and Xbox One and Aug. 30 on Windows PC. Also, Join Our Telegram Channel for more updates. Does mean that pes 2019 would not be having the uefa champions league??? Copyrights © UcheTechs. All rights reserved.